A number of Portland streets in the Albina section were named by Edwin Russell as well as the town of Albina itself, and it is for him that Russell street is named. The records of his life are uncertain as to the date of his birth, but it occurred in England either in 1838 or 1839. His ancestors were prominent in the history of England, the Dukes of Bedford figuring on the paternal side, and his mother was a descendant of Robert Raikes, a great philanthropist and the founder of Sunday schools. Edwin Russel first settled in California on his arrival on the Pacific coast, and in 1870 married Margaretta V. Berry. It was in honor of his wife that Union avenue got it’s former name of Margaretta avenue. 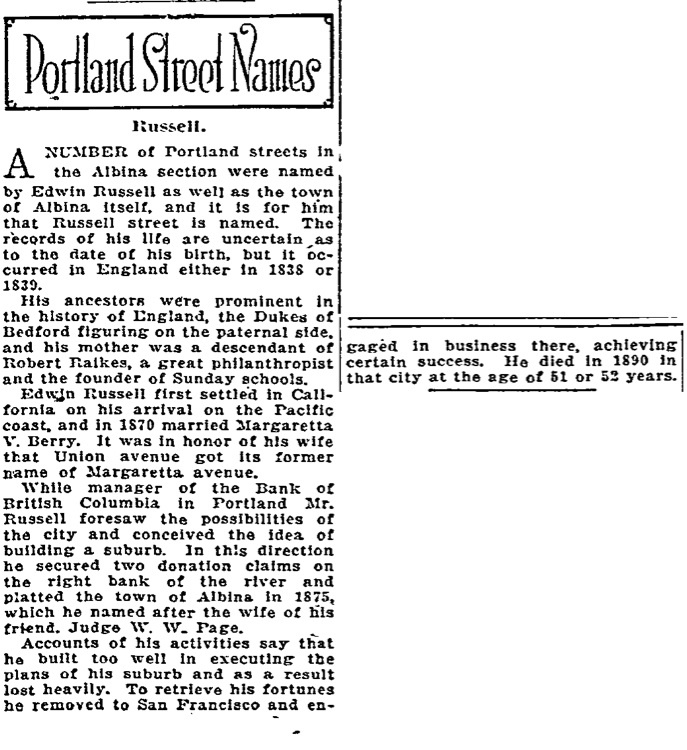 While manager of the Bank of British Columbia in Portland Mr. Russell foresaw the possibilities of the city and conceived the idea of building a suburb. In this direction he secured two donation claims on the right bank of the river and platted the town of Albina in 1875, which he named after the wife of his friend, Judge W. W. Page. Accounts of his activities say that he built too well in executing the plans of his suburb and as a result lost heavily. To retrieve is fortunes he removed to San Francisco and engaged in business there achieving certain success. He died in 1890 in that city at the age of 51 or 52 years.